Four ingredient side dish bliss. Butternut squash roasted with pure maple syrup and oil, then blended with tangy sour cream until smooth and rich. Preheat the oven to 375°F and line a sheet pan with parchment paper. In a large bowl, toss the cubed butternut squash with oil, maple syrup and salt. Spread the marinated butternut squash evenly onto the sheet pan and bake for 45 to 50 minutes or until each cube is very soft. Transfer the butternut squash and any drippings on the pan to a blender or food process. 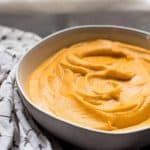 Add the sour cream and pulse 3 to 4 times before blending on high for 1 to 2 minutes – or until the sour cream is well mixed and all the butternut squash has been puréed. Serve alongside your favorite cold weather main meal.